It's still the best affordable option for virtual reality. Samsung's Gear VR has always been an anomaly among the company's dizzyingly diverse product lineup. Ever since the first edition of the headset debuted alongside the Galaxy Note 4 in 2014, it stood out as something potentially more useful than the company's various wearables, experimental phones and other gadgets. And, thanks to Samsung's partnership with Oculus, the Gear VR's usefulness has only grown over time. The follow-up "innovator edition" headset was a big improvement over the first, and we named last year's model a "no-brainer" purchase for Samsung owners. Now we have yet another Gear VR model, coinciding with the launch of the Galaxy Note 7, and it's an even better introduction to virtual reality than ever. Samsung's latest Gear VR is a joy to wear, and it's even more immersive than before. It's an easy buy if you own a Samsung phone, but be aware that Google's Daydream VR platform is on the horizon. 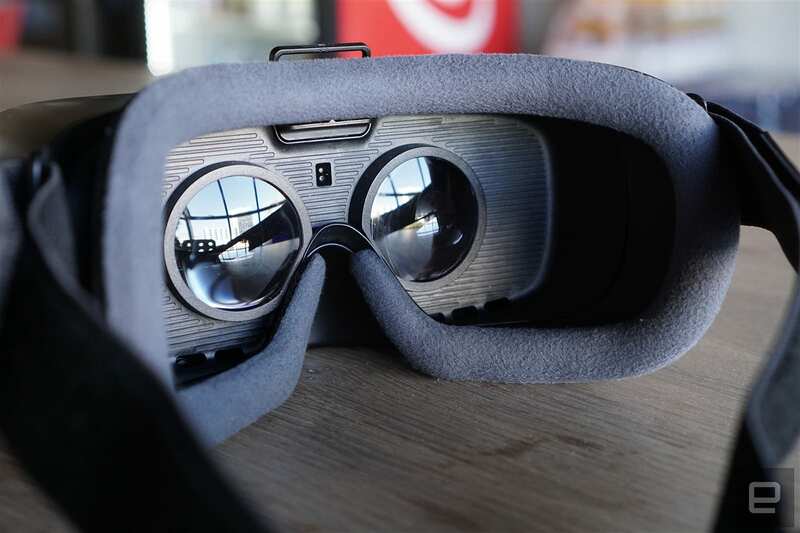 Be the first to review the Gear VR (2016)? From afar, the new Gear VR just looks like a color-swapped version of what came before. But the new dark blue shell actually has a legitimate use: It helps to keep images from your phone's screen from reflecting off of the headset. That was an issue some users had in the past with the white Gear VR models, according to Samsung. And given that the last few models looked fairly similar, it's about time the company made a big design shift to differentiate its latest and greatest headset. There are also a handful of small but genuinely useful ergonomic tweaks. There's a new material that rests against your skin that feels as soft as a fleece blanket meant for babies. And Samsung also made the strap that goes over your head significantly longer, which could be useful for some. Those upgrades, coupled with the Gear VR's light design, make it something you could easily wear for hours on end. After testing both the Oculus Rift and HTC Vive, I noticed that small comfort differences go a long way toward making VR feel more immersive, so I appreciate Samsung's efforts in this regard. As for other changes, Samsung increased the field of view in this latest headset to 101 degrees from 96 degrees in previous models. That might not sound like a major difference, but it's yet another tweak that puts you deeper into virtual experiences. And it brings the Gear VR even closer to the wider 110-degree field of view from dedicated headsets like the Oculus Rift and Vive. Other headsets, like the Star VR, claim to offer even more expansive coverage, but they're not actually on the market yet. If you look closely, you'll also notice some upgrades around the new Gear VR's inputs. The biggest difference? There's a dedicated "Home" button that takes you right back to the Oculus home screen. Previously, you had to hold down the "Back" button to return home. Doing that now brings up a screen that gives you quick access to your settings and friends list. Samsung also cleared out the directional pad from the last headset, so that it's now a free-flowing touchpad area which you can swipe at without worrying about exact accuracy. In a nice move for the Samsung faithful, the new Gear VR is compatible with a handful of the company's older handsets, in addition to the Note 7. 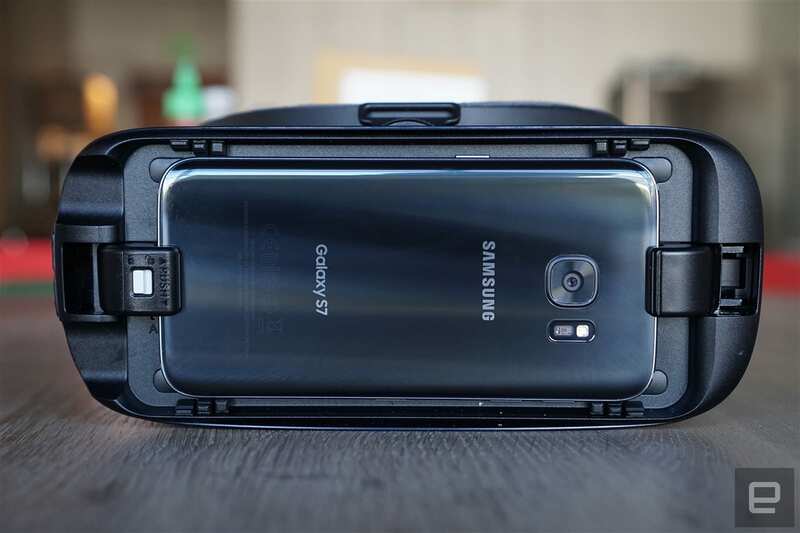 Its support stretches back to the Galaxy Note 5, and also includes the S6, S6 Edge, S6 Edge+, S7 and S7 Edge. Basically, if you've bought a Samsung phone recently, you're covered. While the headset supports USB-C by default (for the Note 7), you can easily swap out that connector with an included micro-USB adapter. You can also adjust the position of the arms holding your phone in place to fit phablets like the Note, or the more sensibly sized Samsung phones. Since our senior mobile editor, Chris Velazco, is still hogging the Note 7, I tested out the new Gear VR with the Galaxy S7. Setting up the headset was simple: I removed the faceplate, swapped in the micro-USB adapter, plugged the phone in, and made sure the Gear VR's arms were positioned for smaller devices. The phone felt securely attached to the headset, even while I shook it vigorously (far more than you would with your head, at least). When I first plugged in the S7, I was prompted to remove it from the Gear VR and install a bundle of Oculus software. If you don't have an Oculus account yet, you'll be asked to create one. Once all that was set, I shoved the S7 (along with a pair of headphones) into the headset and prepared to get my VR on. Within a few seconds, I reached the Oculus home screen and started shopping around for some apps. I settled on NBC's Sports app (featuring the Rio Olympics), Jaunt's collection of 360-degree videos, Eve Gunjack and Adventure Time: Magic Man's Head Games. 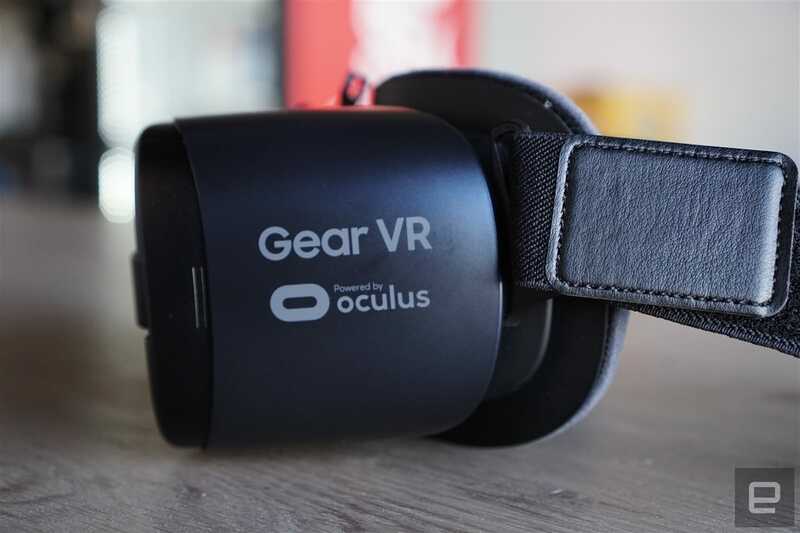 When it came to 360-degree video playback, I definitely noticed the Gear VR's larger field of view. It still feels like you're looking through a pair of binoculars, rather than being completely transported somewhere else, but it's far better than previous models. Unfortunately, the low resolution of most 360-degree video is an even bigger detractor (it's hard to follow the Olympics when you can't determine which fuzzy blob is which). When it came to games, though, the new Gear VR shined. Both Eve Gunjack and Adventure Time were easier to control with the less restrictive touchpad, and they were also more immersive than on previous Gear VRs. I also loved being able to quickly readjust the volume and brightness setting by holding down the "back" button, as I couldn't reach my phone's volume controls when it was plugged into the headset. Mostly, I appreciated the fact that I could wear this Gear VR for a long time without getting fatigued. Even though it's powered by mere phones, Samsung's headset actually has an advantage over desktop VR platforms because it's completely wireless (well, if you don't count headphones). This latest model is simply the most comfortable VR headset on the market. It never felt like the headstraps were crushing my skull, or that the headset was resting too heavily on my nose (looking at you, HTC Vive). As great as the Gear VR is, though, it could have some serious competition from upcoming headsets supporting Google's Android Daydream VR platform. That's basically attempting to do what the Gear VR did, but for handsets from multiple manufacturers. If Samsung were smart, it would work together with Google's platform, but it's unclear if the company's deal with Oculus would prevent that. Even with Daydream headsets on the horizon, though, I don't have any problem recommending the new Gear VR to Samsung owners. In fact, it's solid enough that it's worth considering moving to a Samsung device just for the privilege of using the Gear VR. But the arguments against the Gear VR, and waiting for Daydream, are strong as well.